I'm taking bets on which one of these two guys will be dead first. One would think Castro is the likely candidate, but his death will most likely be of natural causes. yeah...ok...I think he'll be dead within 6 months. Nah, Latin American leaders who totally thumb their noses at the U.S. live longer than leaders who merely assert their independence. Daniel Ortega and Fidel Castro -- still breathing. Jaime Roldós Aguilera and Omar Torrijos -- both dead. 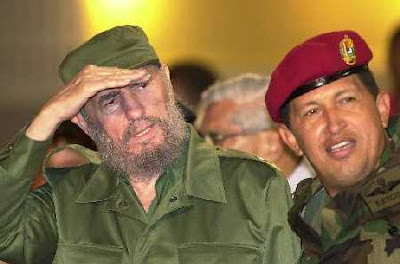 Still, Chavez might want to avoid air travel.